The only thing more exciting than seeing a cool nighttime photo of Dallas’ Theater Row with neon blazing, is discovering that there was once a Dairy Queen downtown! UPDATE: That DQ was there for a VERY short time. It shows up in none of the directories. In fact, its address — 1621 Elm — shows as “vacant” in the 1969, 1970, and 1971 city directories (it was occupied in 1968 by a newsstand — the Elm Street News — until it was raided that year for selling nudie mags). The address disappears altogether after the 1971 directory (it and the Palace Theatre were demolished in 1971). The only evidence I can find of the downtown Dairy Queen’s brief existence on Elm was in a handful of want-ads placed in October, 1969 (about the same time this photo was taken). My guess is that DQ bugged out when they learned the building was going to be torn down. It may have been there only a couple of months. Downtown DQ, we hardly knew ye. 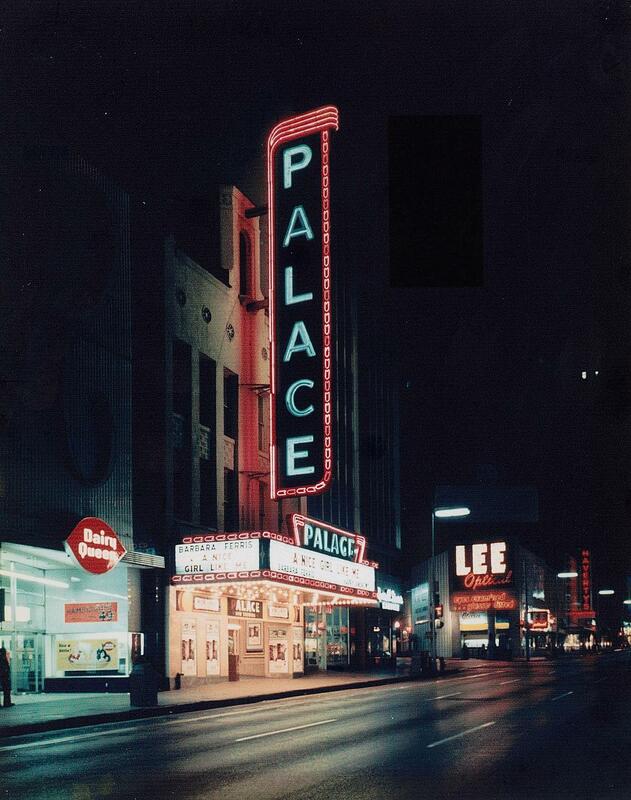 “Exterior of Palace Theatre at Night” is from the Lovita Irby Collection via the Spotlight on North Texas project, UNT Media Library, and may be viewed on UNT’s Portal to Texas History site here. The movie on the marquee is “A Nice Girl Like Me,” starring Barbara Ferris, which opened at the Palace on Sept. 19, 1969. The Palace Theatre was located on the north side of Elm Street, just west of Ervay, at 1625 Elm — by 1969, “Theater Row” consisted of only a handful of theaters. The Palace (and the building housing the Dairy Queen) was demolished in 1971; most of the north side of that block is now occupied by Thanksgiving Tower. I like to imagine an alternate reality where the Coca Cola / Lee Optical sign and its buildings on Live Oak are still around, but now they’re giant curved LED billboards like in Picadilly Circus. This brings memories, I spent a lot of my teens & early 20s downtown, playing & working.